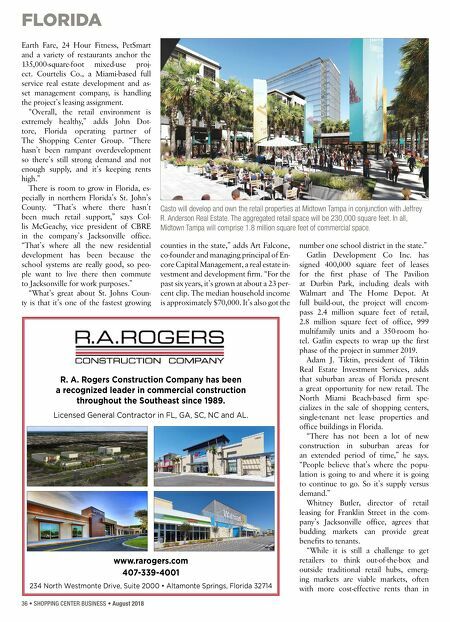 FLORIDA 36 • SHOPPING CENTER BUSINESS • August 2018 Earth Fare, 24 Hour Fitness, PetSmart and a variety of restaurants anchor the 135,000-square-foot mixed-use proj- ect. Courtelis Co., a Miami-based full service real estate development and as- set management company, is handling the project's leasing assignment. "Overall, the retail environment is extremely healthy," adds John Dot- tore, Florida operating partner of The Shopping Center Group. "There hasn't been rampant overdevelopment so there's still strong demand and not enough supply, and it's keeping rents high." There is room to grow in Florida, es- pecially in northern Florida's St. John's County. "That's where there hasn't been much retail support," says Col- lis McGeachy, vice president of CBRE in the company's Jacksonville office. "That's where all the new residential development has been because the school systems are really good, so peo- ple want to live there then commute to Jacksonville for work purposes." "What's great about St. Johns Coun- ty is that it's one of the fastest growing counties in the state," adds Art Falcone, co-founder and managing principal of En- core Capital Management, a real estate in- vestment and development firm. "For the past six years, it's grown at about a 23 per- cent clip. The median household income is approximately $70,000. It's also got the number one school district in the state." Gatlin Development Co Inc. has signed 400,000 square feet of leases for the first phase of The Pavilion at Durbin Park, including deals with Walmart and The Home Depot. At full build-out, the project will encom- pass 2.4 million square feet of retail, 2.8 million square feet of office, 999 multifamily units and a 350-room ho- tel. Gatlin expects to wrap up the first phase of the project in summer 2019. Adam J. Tiktin, president of Tiktin Real Estate Investment Services, adds that suburban areas of Florida present a great opportunity for new retail. The North Miami Beach-based firm spe- cializes in the sale of shopping centers, single-tenant net lease properties and office buildings in Florida. "There has not been a lot of new construction in suburban areas for an extended period of time," he says. "People believe that's where the popu- lation is going to and where it is going to continue to go. So it's supply versus demand." Whitney Butler, director of retail leasing for Franklin Street in the com- pany's Jacksonville office, agrees that budding markets can provide great benefits to tenants. 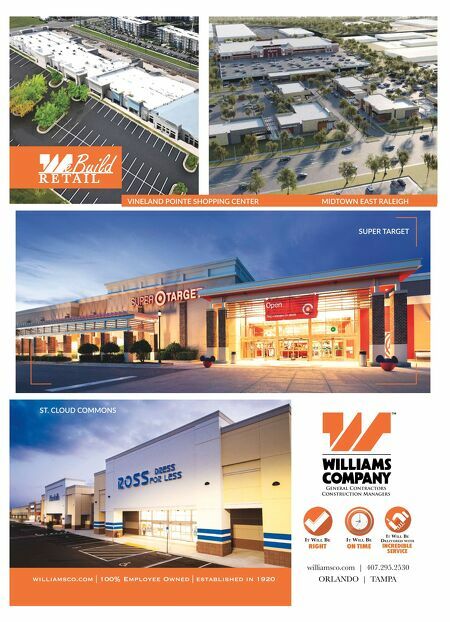 "While it is still a challenge to get retailers to think out-of-the-box and outside traditional retail hubs, emerg- ing markets are viable markets, often with more cost-effective rents than in www.rarogers.com 407-339-4001 234 North Westmonte Drive, Suite 2000 • Altamonte Springs, Florida 32714 R. A. Rogers Construction Company has been a recognized leader in commercial construction throughout the Southeast since 1989. Licensed General Contractor in FL, GA, SC, NC and AL. Casto will develop and own the retail properties at Midtown Tampa in conjunction with Jeffrey R. Anderson Real Estate. The aggregated retail space will be 230,000 square feet. In all, Midtown Tampa will comprise 1.8 million square feet of commercial space.